The Click Rail is a flexible picture hanging system that you only have to mount to the wall once. Using the Click&Connect system, mounting the rail system is fast and easy. The Click Rail (8.5 mm x 25 mm) can be mounted close to the ceiling and some can be repainted, for example in the same colour as the wall or ceiling. This helps the picture hanging system ‘blend in’ with the wall or ceiling, making it nearly invisible. The hanging rail’s ‘unobtrusiveness’ makes it easy to integrate anywhere. 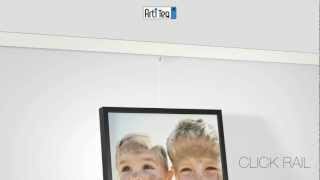 it gives you the flexibility to hang artwork, posters, pictures or photo frames thanks to the hanging wires with hooks that you can click into any desired location on the rail system. Each picture hanging system offers the option of using different hanging wires, such as perlon, steel wire or rods. There are different hooks available depending on the weight of the art or photo frame you wish to hang on the wall. The Click Rail is available in three different versions: warm white, cold white and brushed aluminium. The cold white rail is primed and can be painted over – then you can match the colour of your wall exactly, thereby making it invisible. The rails come in 200 and 300cm lengths. They are easy to cut to the length you require – just use a metal saw.